Note 1. In Windows OS, it is convenient to place Task Notifier into the Startup menu. Task Notifier will then be started automatically when your system starts. Note 2. If Task Notifier is configured for username and password authentication, a dialog box to enter username and password will be displayed at start time. If the username and password are entered correctly, a or icon appears in the right bottom corner of the screen after you click “Login Into System”. If an invalid user name or password is provided, a icon appears in the right bottom corner of the screen. If there are new tasks for the user, a notification message appears in the right bottom corner of the screen. 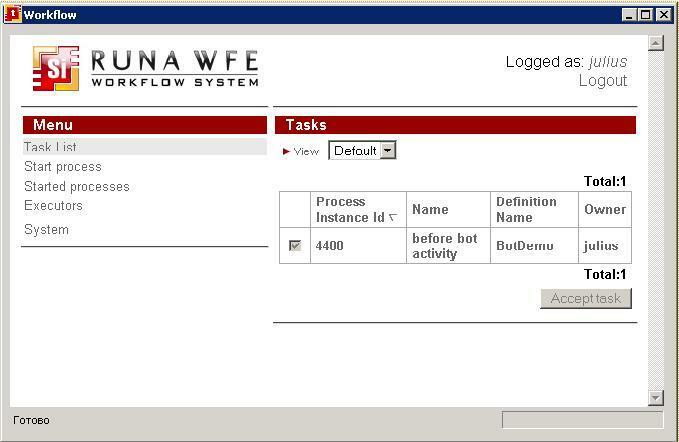 Double clicking the icon or notification message will call the application with the graphical interface of RUNA WFE client. How to work with this interface is described in the document "WFE Server user guide"
This page was last modified on 19 May 2014, at 02:38.